A solid pair of handcrafted door knobs, popular for their weight and simplicity. Our polished Nickel finish achieves a Contemporary take on a Traditional Handle, simple but a real classic. Suitable for use as a Mortice Knob or to use with a Rim Lock. 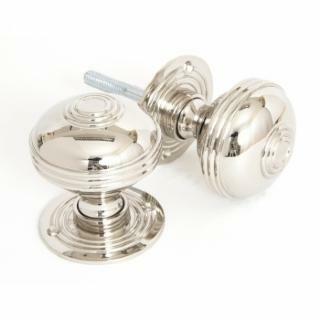 Please note this knob set is also available in Unlaquered Brass if you require a more traditional finish. Our knobs come unsprung, are hollow and have loose roses to enable them to be used with a rim lock (discard one rose) or use with a mortice lock.